Mike was born in Mexborough on 10th April 1929. In Farnham on East Street two years later, a blunt no-nonsense Yorkshire-man named Leslie Hawthorn opened a motor business that was to emerge as The Tourist Trophy Garage. And, in 1958, his son Mike, the so-called Farnham Flyer, would become Britain�s first world motor-racing champion. With only one win that year against four wins of Stirling Moss, he benefited from the gentlemanship of Moss at the Portuguese Grand Prix of Porto, after being disqualified for pushing his car, against the rules. Moss interceded and so Hawthorn could keep his second place in Porto, that contributed to his win in the championship only one point ahead of Moss. After winning the title, Hawthorn immediately announced his retirement from Formula One. 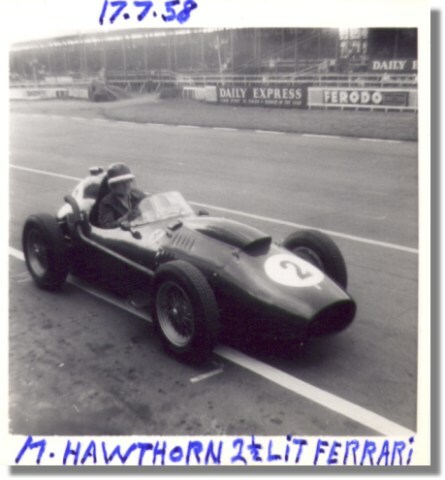 A matter of months later, on January 22, 1959, Hawthorn died in an automobile accident on the A3 Guildford by-pass. In 1955, Hawthorn was the winner of the 24 hours of Le Mans race, despite being involved in the horrible crash that killed 80 spectators.